Blog Athletic Mouth Guards What Do They Do? 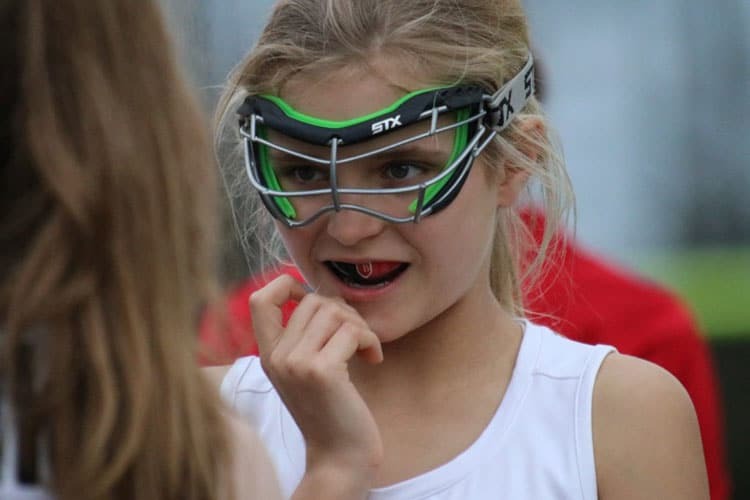 Athletic Mouth Guards What Do They Do? If you have kids, then you most likely spend some time on the sidelines or in the stands at children sporting events. These are fun activities and can lead to a lesson that can last a lifetime. There are certain character building attributes for our children that come from participation in organized activities. They can learn that hard work can yield desired results, or how to work as a team for a great outcome. Nobody disputes some of the values these activities if done right can have for our kids. 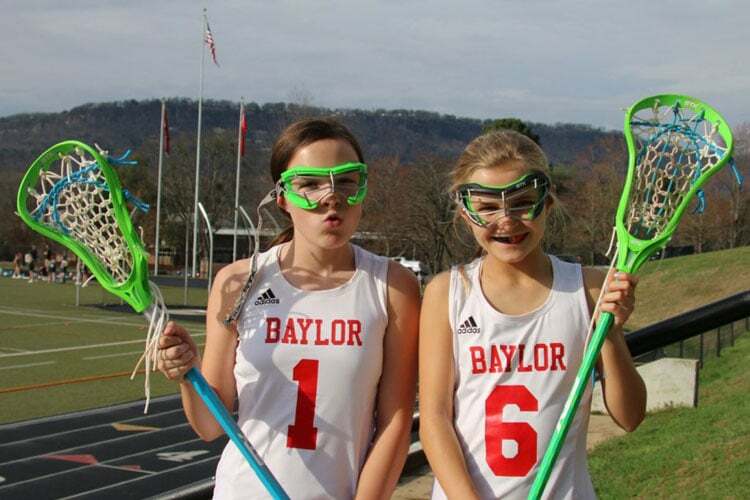 Lacrosse players with mouth guards the one on the left has a store bought guard see how her lips are pursed to keep it in her mouth, the player on the right has a custom fit mouth guard made by McOmie Family Dentistry see how she can smile naturally and the guard doesn’t come loose. According to ESPN, there are 45 million kids that play sports of some type in the United States. That is amazing! 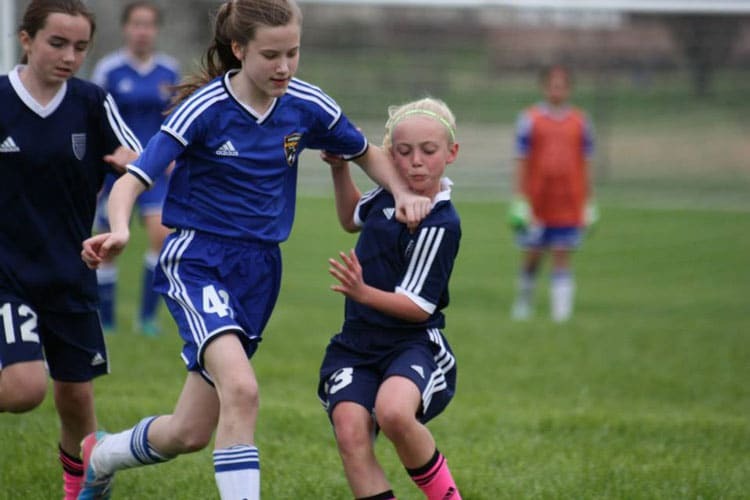 21.5 million kids played a team sport in the United States in 2016. That is a huge number, to put that in perspective that is roughly a population the size of Texas! According to the Center For Disease Control (CDC) in 2016, 2.7 million kids were treated for some form of sports injury. That is over ten percent of the kids participating in a team sport. Sports can be harmful we need to take all the precautions we can. From 2001-2009 Traumatic Brain Injury (TBI) rose 62% in kids under 19 years of age. Top concussion sports bike accidents, football, hockey of all types, ice skating, ATV and dirt bike riding, and surprisingly horseback riding is #1. According to ESPN’s survey, 27% of kids quit playing sports because of injury. We want to do our part in keeping kids active, and we don’t want any of them to quit due to a dental injury! Mouth guards protect our kids from injury this is a fact not an opinion. It is clear that having in a guard will prevent 3 things for sure. Fracture – This is very common. Getting hit in the mouth and chipping a tooth. We see these injuries come into our office in a varying severity. Sometimes they are just a little chip on the edge that we smooth off in a few seconds to a tooth broken at the gumline and it has to be extracted. We do crowns, veneers, and fillings to correct these problems they are fairly common. Avulsion – This is where the tooth is knocked completely out of the socket. Sometimes even the entire mouth and ends up on the ground. In our experience in the last 20 years, we have seen most of these come from playing baseball. A couple from cheerleading as well. Cheerleading is fairly dangerous. They do stunts over wood floors at times. But most of the dental injuries we see from cheer come from when the “flyer” is coming down, and the girls below are catching her. The catchers get a heal from the flyers foot in their mouth and injure a tooth. Luxation – Knocking a tooth loose is luxation. This is usually caused by a direct blow the tooth. Lip and Gum Laceration – Injuries of this type are most common in our patients who are wearing orthodontic appliances, or braces. If there are braces present and it seems they get their lip touched the lips will bleed. Newer types of braces have fewer wires and more rounded type brackets, which helps. But still, they are pretty tough on the lips. The bottom line is mouth guards protect the teeth and gums for sure and could prevent some type of concussions. The concept on mouth guards preventing concussion is when the lower jaw is slammed into the upper jaw. The cover photo on this is of a soccer player taking a hard forearm to the lower jaw. Slamming the lower jaw into the upper jaw like this with enough force can make the brain hit the bony skull causing a concussion. It is thought that having a mouth guard in will lower the chances of a concussion caused by this type of accident. Getting “chinned” or getting hit with someones head in the chin can cause this type of accident that maybe a bite guard will prevent. While some will say there is not a study that proves bite guards prevent any concussion the theory is sound. Remember when it comes to science lack of evidence doesn’t mean it is not true. There is no proof to say one way or the other. Of course we know mouth guards won’t prevent concussions from “whiplash” or being hit on the head directly. There are many studies that say they do limit mild concussions but these are small scope studies. There has not big a large enough study on the topic to say for sure one way or the other. 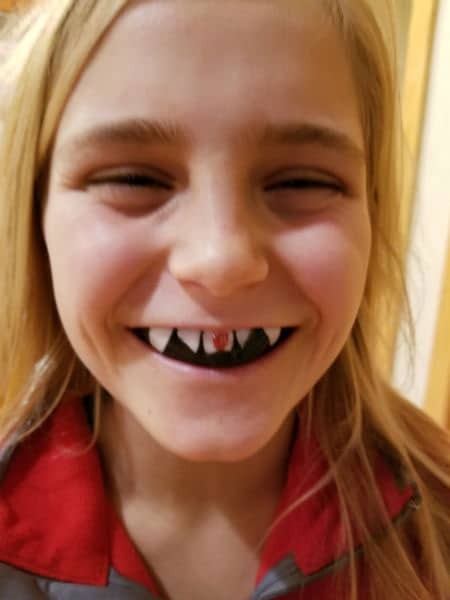 We do know for sure bite guards protect the teeth and after all we are all about teeth. 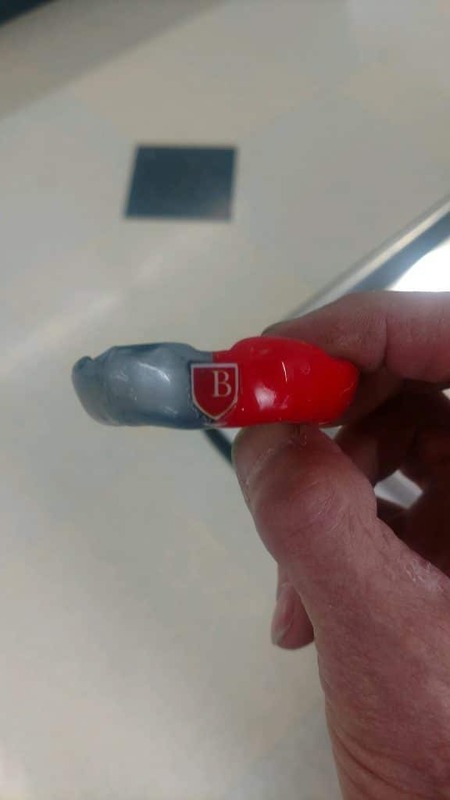 A custom mouth guard made in Baylor School colors with the Baylor School logo. A “fang” mouth guard in place. How Are Mouth Guards Made At McOmie Family Dentistry? The making of a mouth guard is a simple and painless procedure. In the old days (5 years ago) you would have an impression taken using some bulky, not great tasting impression material. Fast forward to today. We have a digital intra oral scanner. McOmie Family Dentistry has the best scanner in Chattanooga and the world. It is a 3 shape Trios scanner. This scanner takes photographs at a rapid rate and then stitches the photos together to make a virtual 3-D representation of your mouth. We then have the models of your mouth printed on a state of the art printer at about 80 microns. This gives a more accurate representation of your mouth then the old impressions. The guard is then fabricated on this model, through a thermoformed multi-layered process. It takes 5 business days for us to get these mouth guards made. When it comes to these custom mouth guards, the sky is the limit on colors. We can do just about any color and any combo of colors, sparkles, dots, etc. We can even do your teams logo on the guard and put your individual name or number. 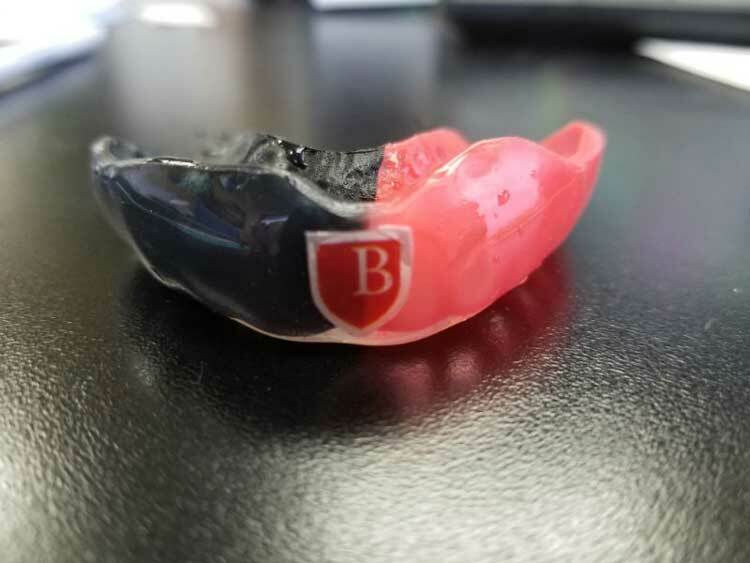 A custom mouth guard done in Red and Black. The guard in place on the lacrosse player. These advantages of a custom mouth guard over other boil and bite or even less custom guards are numerous. You can talk or yell for the pass with these guards in. These are the guards that NFL quarterbacks wear. We usually make them for the upper arch. Please note that most sports leagues won’t allow clear, white, or teeth patterns on mouth guards. They want an un-natural color so the officials can tell the child has the guard in their mouth.